Only in Fez could such fabulously opulent interiors — soaring arches, sumptuous brocade, intricate mosaics, glittering colored lanterns, candlelit courtyards, tranquil Hammams — possibly be the norm. 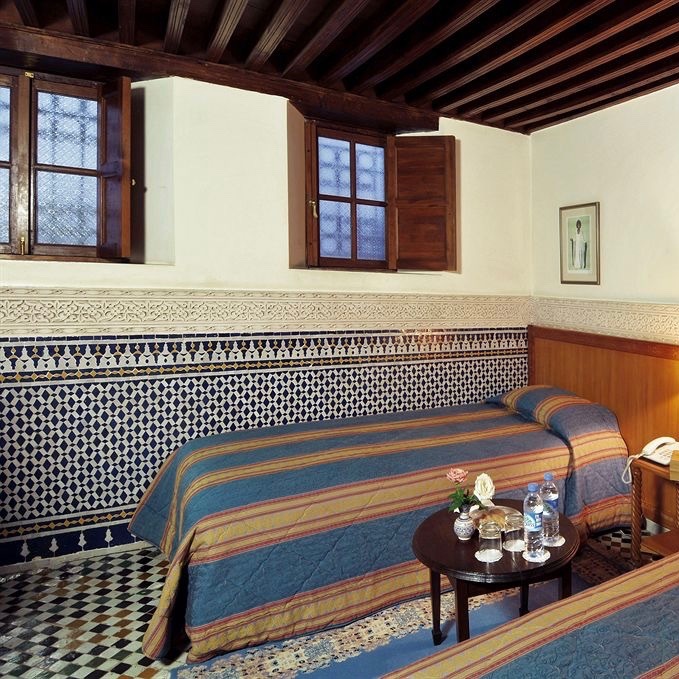 But even in a city teeming with lovely antique riads, Riad Myra stands out. 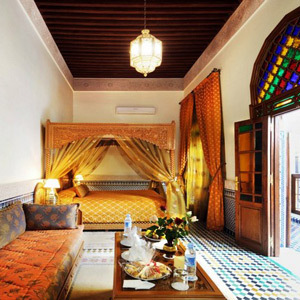 The 13-room hotel bridges the gap between the traditional and user-friendly: it's owned by a respected Moroccan family, known for running a well-regarded restaurant in Marrakech, but the staff here was well-trained to properly receive foreign visitors, translating to a more relaxed entry into Fez — a destination that is, by turns, both magical and totally overwhelming. 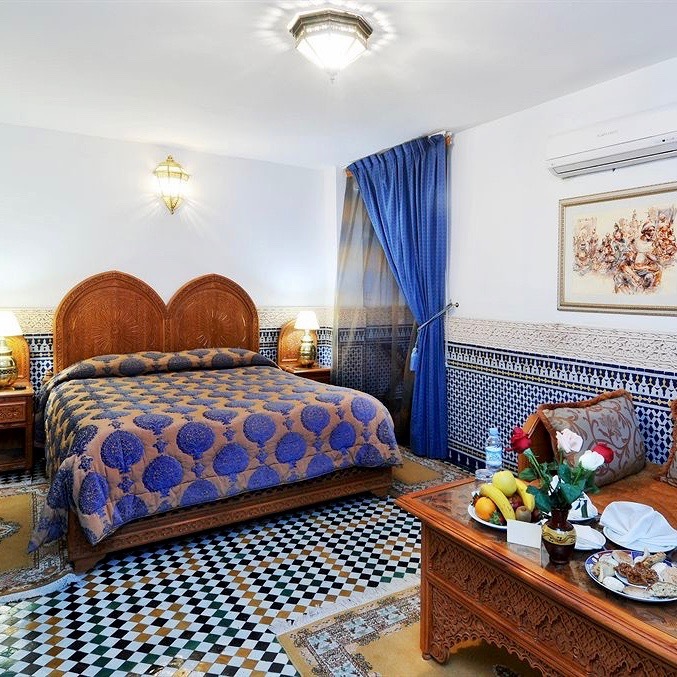 Many of the guest rooms, dreamily furnished with traditional Moroccan pieces and English antiques, romantic drapery and blue tiles, open onto the striking central patio (and its lavish centerpiece, a marble fountain), which doubles as an atmospheric dining space come dinnertime. Only a few guest rooms are standard; most are suites, featuring extras like four-poster cedar beds, separate living rooms and dressing rooms, and huge, luxurious bathrooms lined with traditional tilework and marble accents. Contemporary amenities — complimentary wi-fi, satellite TVs, mini refrigerators — serve as a reminder you that you’re in a high-end hotel. 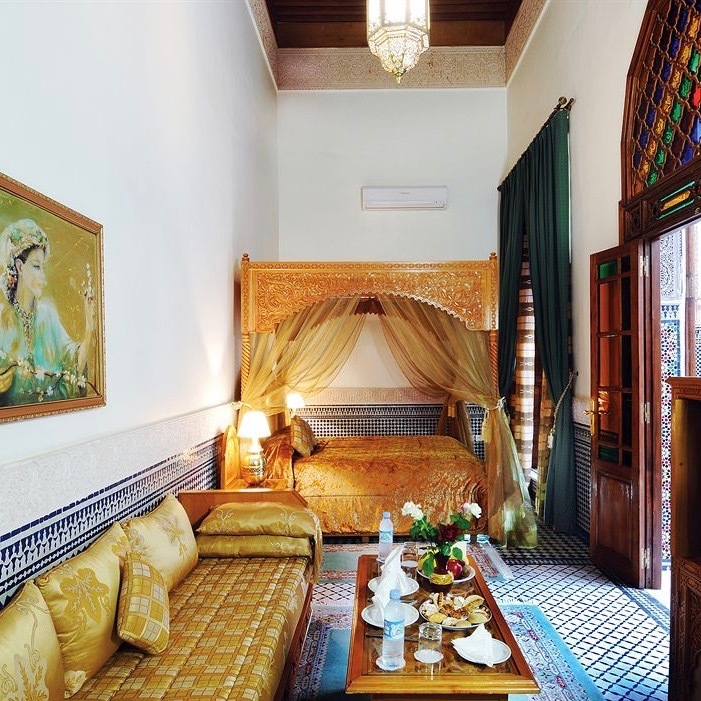 Of course, there’s an elegant hammam offering traditional Moroccan baths and treatments; upstairs, there’s a beautifully tiled terrace looking out over the old medina — it’s an impossibly charming place for a leisurely Moroccan lunch. 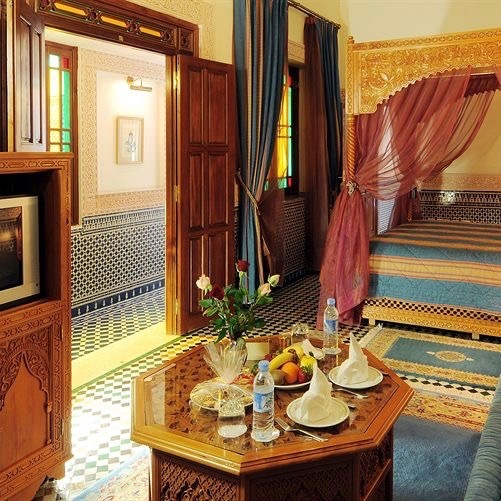 Indeed, if you weren’t in such a fascinating destination, it would be tempting to stay in the riad all day and night.